I had not planned a real stage, as I was not sure about our time of arrival. I had seen a loop that looked attractive – it would avoid the main road to Aime, by going uphill from the start, towards Valezan. 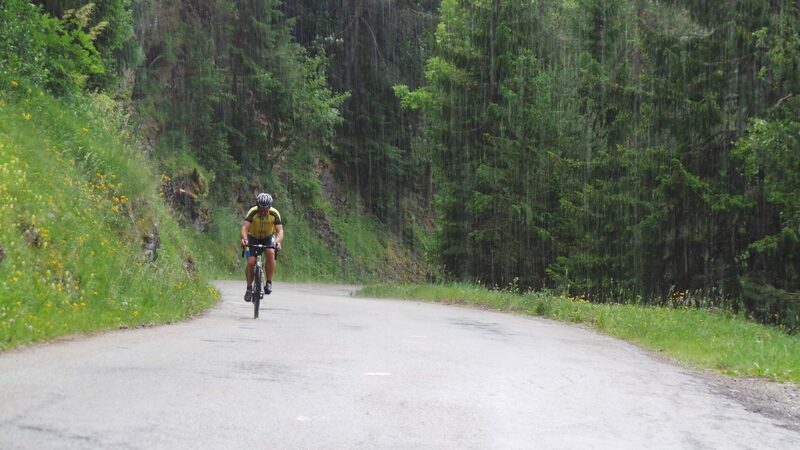 Between Valezan and La Côte-d’Aime it started to rain – drizzling at first, but pouring after a while. However, this stopped before I passed Granier on the way down to Aime. When I got to Aime, Paula accidentally lead the (short) way home over the N90, but we returned and headed back towards Macôt as intended. As I remembered my 2012 climb up to La Plagne all too well, I could not resist the urge to get up there again. Back then, I was recovering from a bad crash and although I liked the climb itself, it was a real struggle. The climb was pretty much as I remembered – it may not be the one with the best views, but you do pass the site of the Olympic bobsleigh event (Winter Olympics of 1992 in Albertville). Trip: 46.5 km / 1,786 m elevation gain (Garmin).